Book Early for 2019 Spring Break Will Sell Out Fast! Enter Your Dates No of Guests Get a Quote with Instant Booking Confirmation! We rent Sat to Sat. during Spring Break, Mid April to Late- October Seasons. Some 4-5 night and Week End rentals are available during winter late fall and late spring or for occasional last minute bookings. Sleeps 35: Ideal for family reunions, Small Weddings, and college groups or corporate off site seminars. The main part of the house sleeps up to 29 in 6 King beds, 2 Queen beds, Bunk Room 4 Twin & 1 Full beds, and 4 queen sofa sleepers. There is also an adjoining lock out apartment under the same roof that sleeps 6 King Bed, Queen Bed & Queen sofa sleeper. 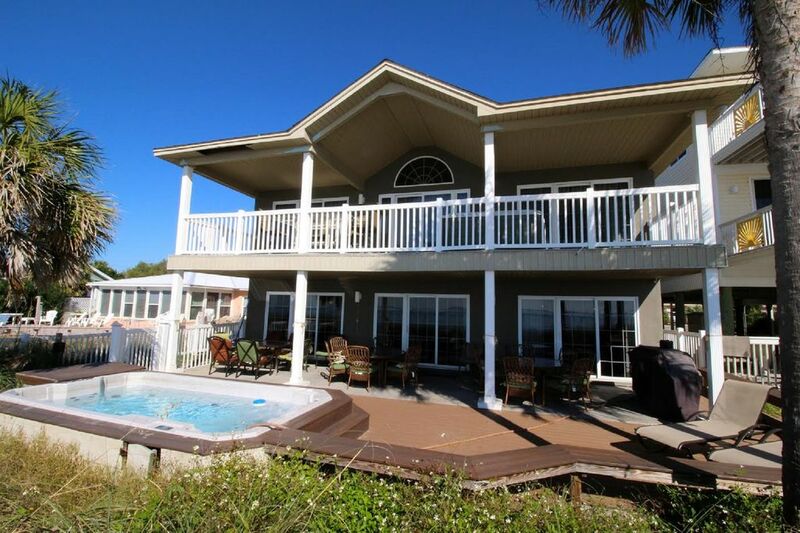 The Surf Drive Beach House VRBO 185803 is perfect for: Family Reunions - Weddings - Spring Break - High School Graduation - Baseball and Softball Teams . Large open kitchen has lots of cabinets, counter space fully equipped with all cookware, cooking utensils and small appliances. Plenty dishes, glasses cups and silverware. Large Laundry Room 2 sets of washers and dryers. Adjoining Lock Out Apartment sleeps 6 Master BR King bed a Queen bed in a loft bedroom with private balcony, Queen Sofa Sleeper in Living Room Kitchen & Full Bath. This apartment also has private front & beach entrance. We rent to families with a $500 security damage deposit. For groups all under Age 25 $1,500 is required refunded 14-21 business days of departure date if there are no problems. State, County, and City taxes are included in the total price quoted. Spring Break / HS Grad Weeks Base Price is for 20 guests add $100 each 21-35. A $1,000 Reservation Down Payment is charged to the credit or debit card you provide to take this house off of the rental market for you. If you cancel for any reason this down payment is nonrefundable. Final Payment for accommodations must be received ½ 90 days prior to arrival ½ 60 days prior to arrival. Exceptions made for bookings made within the 90 day window. Extra person charges may apply if the total number of people are increased after the initial reservation. We had a great stay, for a large group this is where you want to be. Their is plenty of room for everyone. This is a great location having direct access to the beach. Sitting in a spa watching the beautiful sunsets is incredible. Would recommend this property to anyone!!!!! Great space for large groups, especially families! The spacious property was awesome. The property had large open areas as well as separate areas for privacy. We had fun in all areas of the house inside and out! The beach access cannot be beat! 5-star review. Your email to me was very nice how you celebrated your mother's birthday. I have managed this house since March 2010 it is rented almost every week by all kinds of different people. You left the house in the best condition ever and I greatly appreciate it and so do our housekeeper's LOL. It was my pleasure having you and your family as our guests we welcome you back again next year! This beach house is amazing for a large family. The beach house was wonderful. It had plenty of room. Everything was perfect. Friendly neighbors. We had a wonderful stay. My family is already asking when will we be returning. The house was extremely comfortable and I felt like I was at home. I will be renting this property again. Really big house with plenty of space for many people. Overall, a nice house with nice furnishings. There were some issues with items that needed to be repaired or replaced (broken grill, leaky hot tub, etc), but hopefully these are things easily addressed and repaired. In all fairness, we did not report these items while there as they were more frustrating than critical. We stayed here with a large group for a company fishing trip. We plan to book this same house for future trips. This house was amazing for our large family! Thank you Bob and Emerald Coast PCB! This home was perfect for our large extended family. We have been coming to PCB for the past 10 years, and have always rented multiple houses side by side, or a "complex" with multiple buildings. We have now finally found the perfect home away from home for our family reunion! When we arrived, we were amazed at the sheer size of the downstairs common rooms! EVERYONE (28 people) had plenty of space! We had a few long storms, but they were no big deal. The kids hung out in the large living room with the big TV, and the adults prepared food , socialized, or watched golf in the bar area, kitchen and front parlor. The owner's suite was perfect for the family with a newborn. Nice, quiet, and separated from the crowds. The porch is AMAZING. Very shaded, protected from the rain, and a great happy hour hangout. The master bedrooms upstairs and in the owner's suite - just wow! Huge, richly furnished, and very comfortable. It's also located far enough East that we pretty much had a private beach to ourselves! When we got home, we took a vote, and yes, this is where we are going next year. To ensure it was available, we booked almost a year in advance for June 8 - 15, 2019. As a side note, everything in the house was very functional, so we didn't have to call their local contact number for any maintenance needs during our stay, but I'm sure they would have been taken care of them promptly if there had been any issues. Thank you!